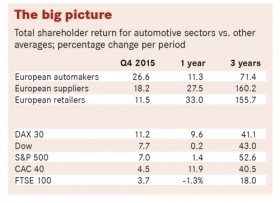 The European auto industry ended last year with strong gains in shareholder value across the board. 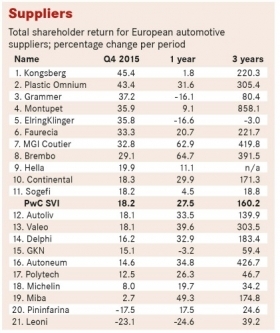 The latest Automotive News Europe/PricewaterhouseCoopers Transaction Services Shareholder Value Indices show that the value of Europe’s publicly traded automakers rose 26.6 percent in Q4 while the value of suppliers increased 18.2 percent and retailers climbed 11.5 percent. This followed a bleak third quarter in which all sectors had recorded declines, with automakers down 27.9 percent. The fourth-quarter recovery mirrors that seen on most European exchanges. The German DAX 30, for example, gained 11.2 percent in Q4 following a Q3 decline of 11.7 percent and the FTSE 100 edged up 3.7 percent following a previous-quarter dip of 6.1 percent. 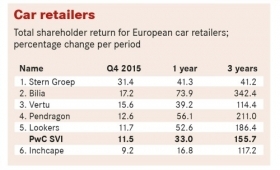 One of the fourth quarter’s biggest winners among the automakers was the Volkswagen Group. Despite being embroiled in an emissions cheating scandal, VW increased its value to shareholders by 34.5 percent – the second-highest gain recorded in the quarter by any manufacturer tracked by ANE/PwC. The increase followed a 49.8 percent decline in shareholder value during Q3. Despite estimates that its losses will be in the billions of euros, investors felt the crisis discount for VW was too extreme. Their confidence was boosted in October when VW revealed it was in discussions with the authorities in EU member states to limit legal action to that already agreed with Germany's federal motor transport authority (KBA). The following month VW said it had fixes for 90 percent of the cars in Europe affected by the emissions scandal and that a recall process was viable "technically, financially and in terms of manpower." Then in December VW revised its estimate of the number of cars affected to as low as 36,000 units from 800,000. 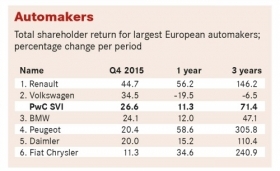 While VW’s comeback was significant it was not the biggest winner of the quarter among automakers. That distinction went to Renault, which rebounded from a 31.5 percent fall in Q3 with a 44.7 percent gain in Q4. At the start of November the French automaker's share price fell on the news that the French Prime Minister had ruled out a merger with Nissan. But in the following month Renault-Nissan entered into a deal to defuse tension with French government. The "alliance stability covenant" restricts the French government’s ability to interfere in the affairs of Renault-Nissan. In return, Nissan's stock in Renault will remain without voting rights. Germany's BMW took third place, reversing a 19.8 percent Q3 drop with a 24.1 percent gain. Peugeot was up 20.4 percent and Daimler 20.0 percent in the latest quarter. The poorest performer was Fiat Chrysler, up just 11.3 percent. But an important reason for this is that it had been the best performer in Q3, when it confined its loss to just 11.6 percent of its value. So in reality, like the two best performers this quarter, its shareholder value is virtually back to where it was at the end of June last year. Only one parts supplier achieved any meaningful growth in Q3 last year. But in the fourth quarter all but two recorded strong gains in shareholder value. Norwegian driver controls and cable specialist Kongsberg was No. 1 with a 45.4 percent increase, followed by French bumper and fuel tank provider Plastic Omnium at 43.4 percent and German seat maker Grammer at 37.2 percent. The two weakest performances came from Italian design and engineering specialist Pininfarina, down 17.5 percent, and German-based wiring suppler Leoni, down 23.1 percent. In Q4 Kongsberg won sizeable contracts totaling 145 million euros, including a 10-year agreement with a European premium automaker for the global supply of heat and seat ventilation to midsize luxury vehicles. It also withstood an attempt by minority investors to elect a new board of directors. Grammer benefitted from its acquisition of the metal and plastics firm Reum, which will enhance its technological capabilities and expand its product range. Plastic Omnium’s shareholder value rose on news that it agreed to acquire Faurecia's automotive exteriors business in a transaction valued at 665 million euros. The Faurecia unit, which includes bumpers and front end modules, had 2014 sales of 2 billion euros. About 90 percent of the business is located in Europe. The acquisition is expected to boost Plastic Omnium’s sales above 8 billion euros ($8.81 billion), placing it among the 25 largest automotive suppliers worldwide. In the automotive retail sector the largest car dealer in the Netherlands, the Stern Groep, increased its shareholder value by 31.4 percent while its Swedish counterpart, Bilia, rose 17.2 percent. They finished No. 1 and No. 2, respectively, for the second quarter in a row, followed by the UK's Vertu Motors and Pendragon. Another UK retailer, Lookers, up 11.7 percent, and global distributor Inchcape, up 9.2 percent, were once again in the bottom two spots. Gains from the sale of property and leasebacks, improved liquidity, sales growth and increased market share were all factors working in Stern Groep's favor with investors in Q4. Expansion through acquisitions added VW commercial vehicles and Audi to its brand portfolio. The purchase of a well-established online vehicle parts business is also expected to give the group momentum.